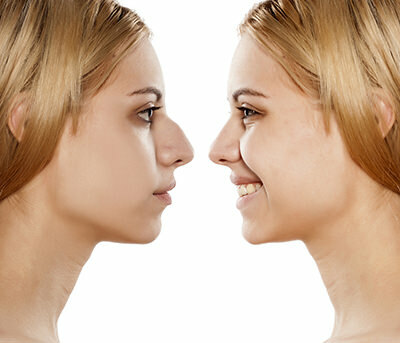 Rhinoplasty is a surgical procedure that creates an improved look and proportion to the nose. This, in turn, helps to create a more pleasing facial composition. Rhinoplasty can also be performed to correct impaired breathing. This condition may be the result of an abnormal structure in the nose, due to heredity, injury or some other reason. Nose surgery to correct an obstructed airway requires a careful assessment of the structure of the nose. Correcting a deviated septum, a common cause of breathing difficulty, is achieved by adjusting the nasal structure. In some cases, a deviated septum can be corrected in conjunction with a rhinoplasty surgery. Dr. Tahiri performs rhinoplasty, using one of two procedures: A closed technique allows him to hide any incisions inside the nose. The alternative is an open method, where he makes an incision across the columella (the narrow strip of tissue that separates the nostrils). Through this incision, Dr. Tahiri can gain access to gently lift the covering of soft tissues, allowing him to reshape the structure of your nose. Where more dynamic reshaping of the nose is needed during a rhinoplasty procedure, Dr. Tahiri is able to reduce or enhance nasal structures by the use of miniscule amounts of cartilage taken from other areas of the body.